'Tha 40oz' EP is scheduled for a July 27th release and is said to be one of the first projects in his career he's had the most fun recording, taking only one week to record it. "I can't remember the last time I was so excited about recording a record. It's been a while since I just got in the booth and everything sort of came to me", says Mr. Envi'. Mr. Envi' dropped a few hints that a new project was in the works on May 2nd via his Facebook account, stating "new music coming soon, but until then rock out to 'Make Em Believe', a single he had released in March of this year. The first single off the new release 'I Gotchu', is set to be released Monday, July 9th, with a music video to follow shortly after the release. 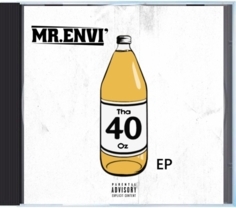 'Tha 40oz' EP also features guest appearances from JTL, Mr. HympDok, Big Ced and MistaTBeatz. Pre-orders for 'Tha 40oz' EP will be available after the 4th of July weekend, as well as bookings for a promotional tour that's sure to follow. In his latest project named ‘Make Em Believe’ the highly gifted and simply terrific Mr.Envi showcases to us just why he is the name to follow in the world of music with phenomenal production and lyrics. With this splendid single released, we are sure to hear more great things from this exciting and rapidly growing artist known as, Mr Envi. This one is for the playlists.